What happens after we send through our logo? Once we have received your logo and it is in a suitable format/quality, we’ll print a sample and send you a photo for your approval. What if we don’t like the layout of the sample? No problem, we’re happy to get your feedback and make any necessary changes to the layout to meet your requirements. Once we’ve made the changes, we’ll email through a new revision to your logo for your approval. What if we need to change the layout and/or contact details later? No problem, just let us know what changes you require and we’ll send through a new revision for your approval. What does it cost to set up our logo? For new logos/layout in an order of up to 10 wallplates, there’s a one-time set up fee of $50. There’s no set up fee for orders over 10. When you later re-order the same logo/layout, there is no set up fee. What does it cost to print our logo? Printing your logo is free of charge. Do you print in colour? Yes we can print in full colour and to any (HEX coded) colour. Plain black or a beautiful vibrant white is also possible. What is the Minimum Order Quantity for logo printing? There is no MOQ. 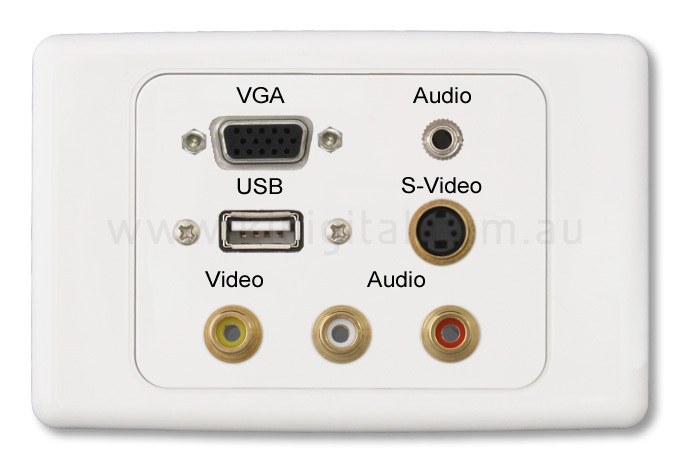 Once your logo is setup in our system you can order 1 wall plate with logo if that is all you require. Will our logo fit onto a wallplate with multiple connections? When printing a wallplate with your logo, we usually move the connections around to best fit your logo and other details. If for any reason your logo and/or info does not fit onto a wallplate, we will inform you. What is the limit in terms of logo size on a wallplate? There is no real limit in terms of logo size that is printed onto a wallplate. Just remember that the bigger your logo, the less room available for connections. There is a lot of detail in my logo, can you print it? Our printers can print very high resolution, but when a logo is shrunk to a very small size, some details just may not be clear. If this is the case, we’ll let you know. We can email through an image of a sample of your printed wallplate for your approval. This is why supplying us with a high definition logo is important. Why do you require a High Definition image when you are printing such a small logo? We require a high definition logo because of the process that is used to set up the logo for printing. We make quite a few adjustments behind the scenes to get your logo in a format that will look great when printed onto a wallplate. Can our logo be printed onto a black wallplates? Yes, your logo can be printed onto a black or other colour of wallplate. We print a white primer underneath your logo in order to show up your logo’s colour vibrantly. Our logo has black in it. Can this be printed onto a black wallplate? We offer 2 choices when it comes to printing black logos onto black wallplates. The first involves simply reversing the black colour to white when printing. The second options involves printing a white outline around your logo. We are happy to email through samples if you would like to see the end result. Will our logo fade/smudge/scratch off? No, we use UV ink that is cured onto the wallplate. Our ink is specially designed to be used on plastic surfaces. We only require our logo to be printed on some orders. Is this a problem? Not at all. Some customers like to have their logo printed onto every single wallplate they order, while others only require their logo to be printed on certain orders. Just let us know when ordering. Can you print our customer’s logo onto a wallplate? No problem. Simply send through your customer’s logo and we’ll set it up in our system exactly the same way as any other logo. When ordering simply mention ‘with customer X logo’. Can you print switch mechanisms with custom images/logos? Yes we can. Send us your requirements, we are happy to discuss this. Is it better for our logo to be at the top or the bottom of the wallplate? This is entirely your choice. We have found that once AV leads have been plugged into the wallplate, a logo is more visible when printed at the top of the wall plate. How are Kidigital wallplates different from other printed wallplates on the market? We have been printing logos onto wallplates since 2010 so we’ve learned a few tricks along the way in order to get your logo looking as good as possible. We can print full colour logos onto just about any wallplate. Our lead time on custom wallplates with logos is 1-2 working days. Large quantities take a little longer. We can supply up to 100,000 wallplates but understand that some jobs only require 1 wall plate so we are happy to accommodate any quantity. We can also print in vibrant white. Can you print our logo onto our own brand of wallplate? Usually yes. You will have to send us some samples to test before we can be sure that printing will work.